Home › Mountain hawk-eagle › Peregrine falcon - Falco peregrinus. The peregrine falcon (Falco peregrinus) belongs to the family Falconidae. These peregrine falcon species are distributed in Indian subcontinent, Asia, Europe, Africa, Australia, North and South America. Falco peregrinus was earlier placed in the genus Rhynchodon. Falco peregrinus is closely related to Falco mexicanus and to Falco fasciinucha. There are nineteen recognized subspecies of peregrine falcons. 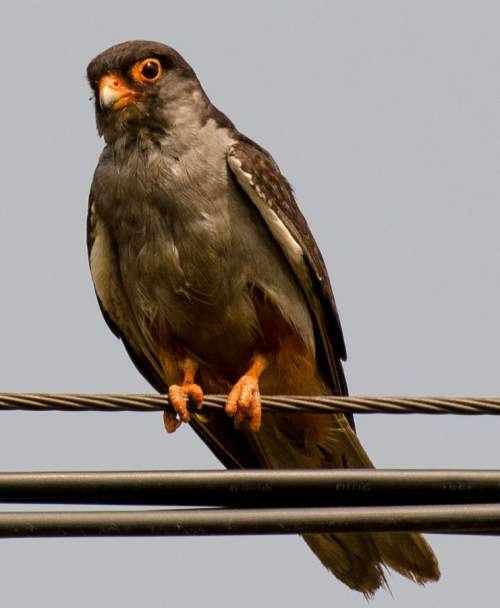 The subspecies Falco peregrinus peregrinator occurs in Pakistan, India and Sri Lanka and China. 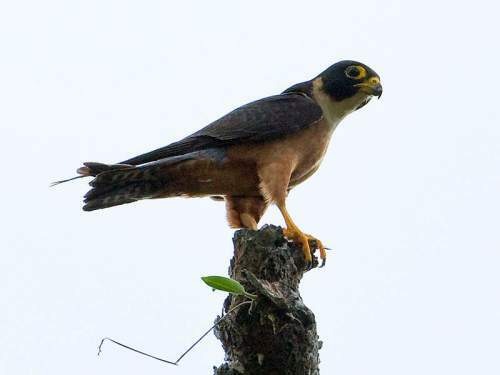 The Falco peregrinus peregrinator is also known as Indian peregrine falcon, Shaheen falcon or Indian shaheen. The peregrine falcon is a medium sized bird of prey, measuring 35 to 50 cm in length and weighing 550 to 1,500 grams. The female peregrine falcon is considerably larger than the male. The wingspan is 80 to 120 cm. It has blue-grey back and barred white to rusty underparts. The head is black. A prominent black moustache is present along the cheeks. The wingtips are black. The tail is black, narrow and rounded, having a white band at the end. The sides of the neck and throat are pale or white. The cere and feet are yellow. The beak and claws are black. Their call is a loud series of 'kak, kak, kak' sound. The peregrine falcon inhabit extremely variable habitats. Their habitats includes mountain ranges, river valleys, coastlines and increasingly cities. The peregrine falcon species feed mainly on birds. They feed on medium-sized birds such as pigeons and doves, waterfowl, songbirds, waders, smaller birds of prey and game birds. 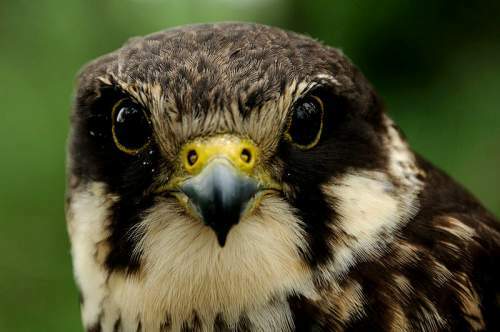 These falcon species also feed on reptiles, small mammals and insects. During the stooping flight, the prey is typically struck with a clenched foot, stunned and captured in mid-air. The peregrine falcon breeding season varies according to their range. A falcon pair mates for life. They nest in a scrape of shallow hollow in the loose soil, normally on cliff edges. Large tree hollows are also used for nesting. The clutch size is commonly three to four eggs. The male bird also incubates the eggs. Both the parents take part in raising the chicks. Except extreme polar regions, these peregrine falcon species are found nearly everywhere on the Earth. They are entirely absent is New Zealand. 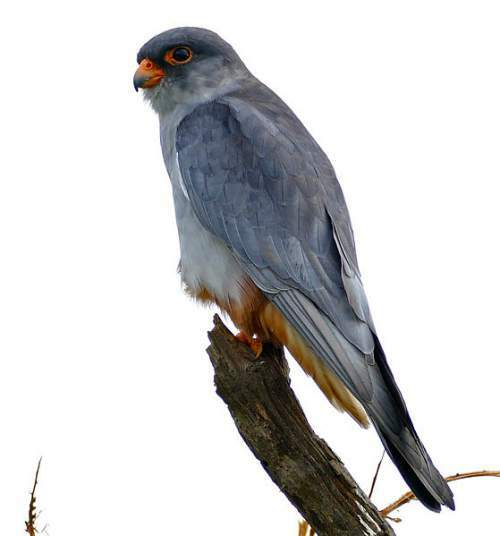 The subspecies Falco peregrinus peregrinator is distributed in Indian subcontinent and southern China. 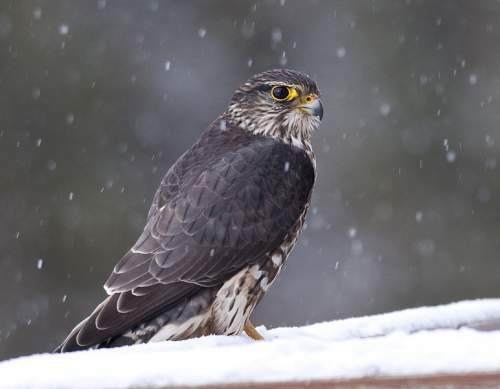 The peregrine falcons in temperate and Arctic zones are highly migratory. They migrate southwards in the winter. The peregrine falcon species have wide range of habitats and are considered least vulnerable. There was a sharp decline in the population due to the use of organochlorine pesticides, especially DDT. 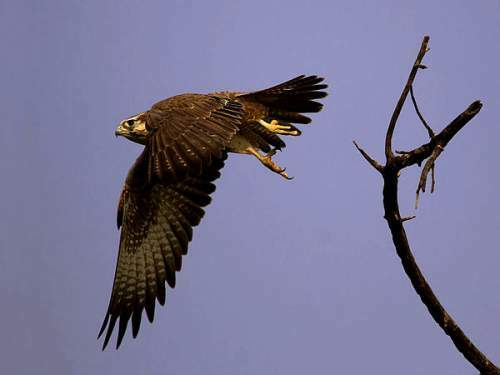 Hunting and egg collection also caused decline in the falcon population. With conservation and protection works and widespread restriction of DDT use, there is remarkable recovery in the population. 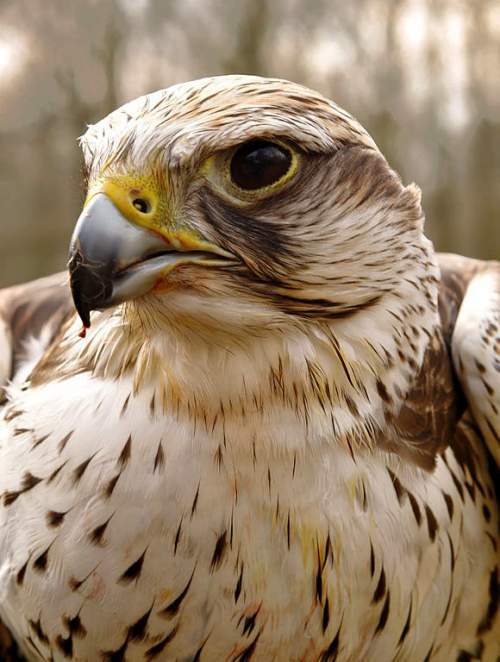 The capture of wild falcons and fledglings for falconry and impacts with manmade structures are the main threats to the survival of these falcon species. 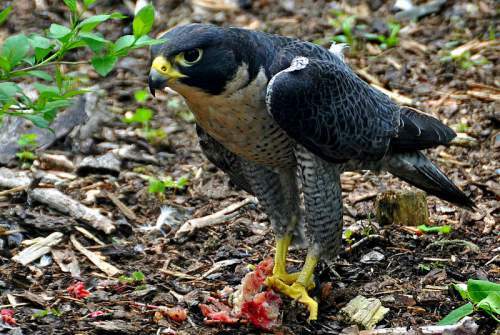 Current topic in Birds of India: Peregrine falcon - Falco peregrinus. Home › Changeable hawk-eagle › Mountain hawk-eagle - Nisaetus nipalensis. The mountain hawk-eagle (Nisaetus nipalensis) belongs to the family Accipitridae. These mountain hawk-eagle species are distributed in Indian subcontinent, Indochina, Southeast Asia, China, Japan and Indonesia. Nisaetus nipalensis was earlier placed in the genus Spizaetus. It is closely related to N. bartelsi, N. alboniger, N. lanceolatus and N. philippensis. The three recognized subspecies are: N. n. orientalis (Temminck & Schlegel, 1844), N. n. nipalensis Hodgson, 1836 and N. n. kelaarti (Legge, 1878). The mountain hawk-eagle is a large bird of prey, measuring 65 to 85 cm in length and weighing 1,800 to 3,500 grams. The wingspan is 130 to 160 cm. They typically have brown upper parts and paler under parts. The under sides and tail are barred. The breast and belly and underwing coverts are streaked. 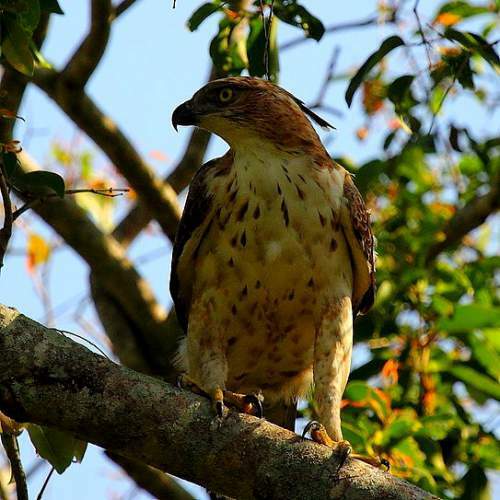 The mountain hawk-eagle inhabit mountain woodlands. They have been observed in mountains at altitude of 4,000 meters. These species feed on birds, reptiles and small mammals. Hares, pheasants and quails are the preferred preys. The mountain hawk-eagle breeding season varies with their range. In Himalayas, these eagles breed during February and June. They build stick nests on trees. The nest contains a single egg. The subspecies N. n. orientalis is distributed in Japan. The subspecies N. n. nipalensis is distributed in Pakistan, Himalayas of India, Nepal, Bhutan, China, Indochina region and Malay Peninsula. The subspecies N. n. kelaarti is distributed in South India and Sri Lanka. These species of birds are mostly sedentary. In winter, they may move to lower altitudes. The mountain hawk-eagle species have an extremely large range and are considered least vulnerable. There is steady decline in population due to loss of forest cover. Habitat destruction and declining availability of prey species are the main threats to the survival of these species. Current topic in Birds of India: Mountain hawk-eagle - Nisaetus nipalensis.